I’ve mentioned before that I keep a list of subjects people ask about and University of Georgia prints have been on that list for awhile now. But these things come as time allows and inspiration hits. But the motivation was high because I had people actually coming to my website and searching for University of Georgia prints from the search here! I was beginning to feel a bit of pressure especially since Georgia is my home! And recently the right subject began working its way into my mind. I had seen pictures of The Arch before, but I didn’t know much about this particular UGA landmark, I will admit. After researching it a bit more I knew I had found the subject of the first of my University of Georgia prints! The Arch is kind of fascinating to me because it’s a bit of a time traveler. 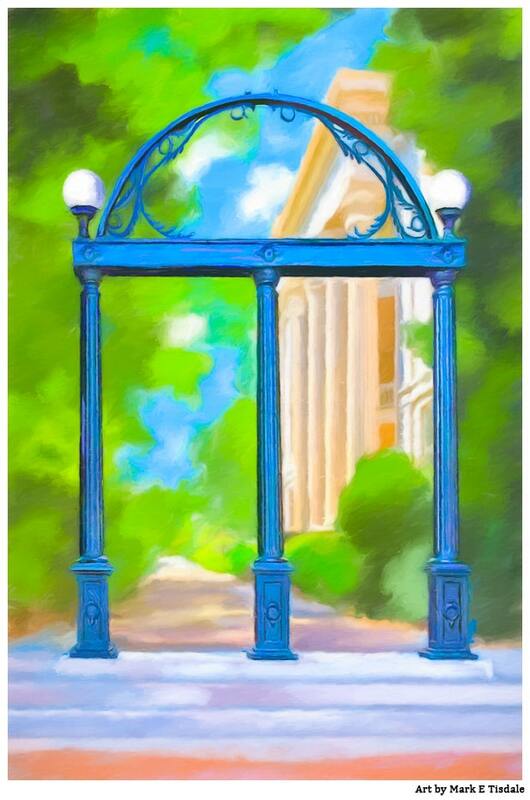 At just over a 160 years old, it was originally known to University of Georgia students as The Gate. And clearly it was an ornate gate, but it wasn’t entirely decorative. It was part of a fence that went around the old campus to prevent cows from grazing on the campus lawn. Life in Athens has clearly changed a great deal in the past century and a half! By the early 20th century, the gates and the fence were gone leaving the lone arch as a sentinel on the edge of the historic campus. And it gradually became known as The Arch instead of The Gate. It was in this same period that a University of Georgia tradition started that students should avoid walking through the arch before their graduation. 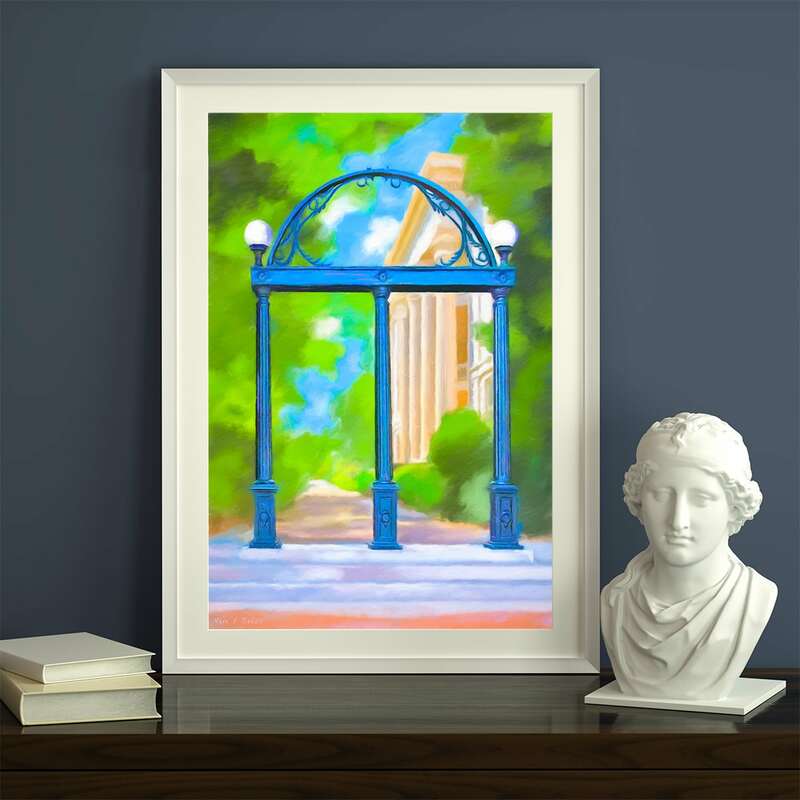 I love old architecture and traditions and this University of Georgia print has them both! The background of this print is a dreamy mix of foliage and sky and the Holmes-Hunter Academic Building. Only the arch is done in more detail making the subject of this print really stand out from the background. 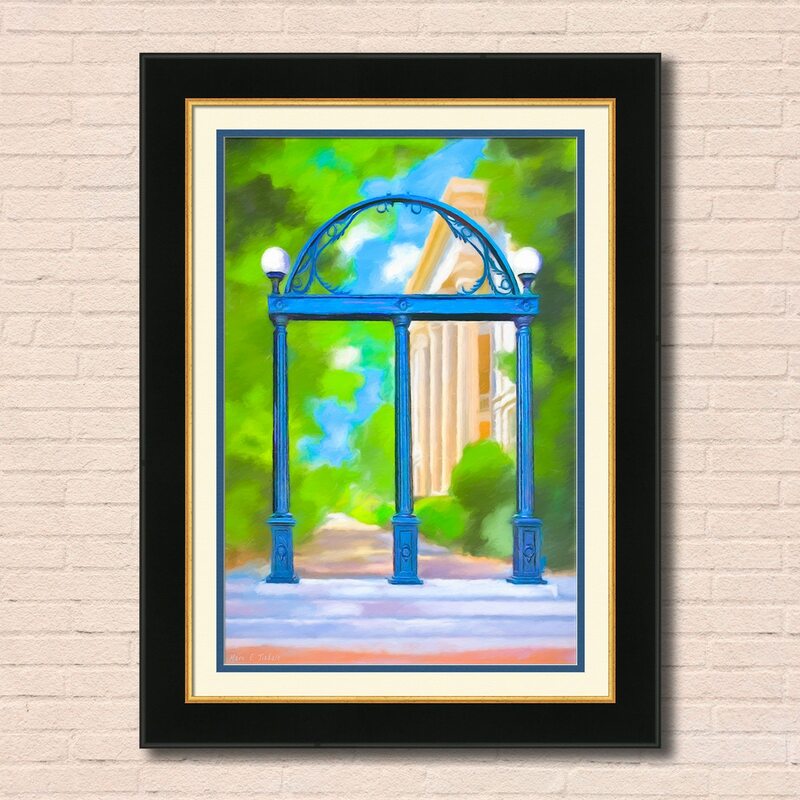 If you’re interested in buying University of Georgia prints or indeed any of my other work, you’ll be happy to know they are available in a range of sizes from small prints suitable for gifts or mementos as well as large canvas prints and framed wall art that make for great statement pieces in your home or office. If you have questions about this artwork or print questions in general before or after buying, don’t hesitate to send me a message. I hope you might stop to share your thoughts in the comments below. 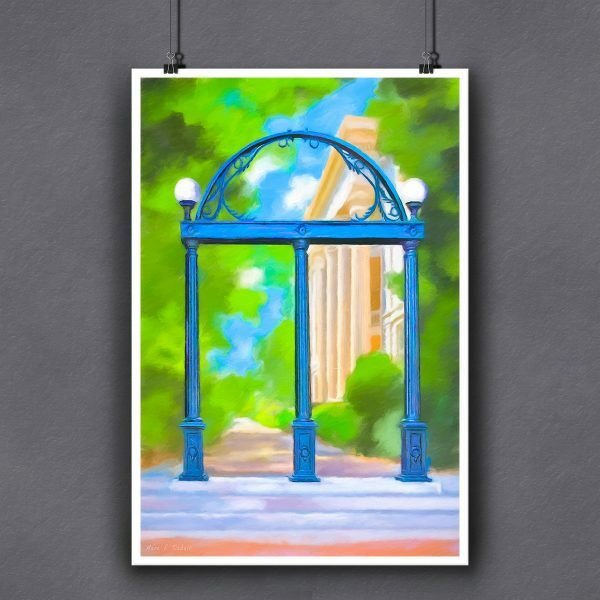 Whether you’d like to share memories about The Arch at UGA or you’ve bought this print and would like to share your thoughts on it, please do so!